A few years ago, I got good results1 using Phrak’s Greyskull variant. I bought the actual Greyskull book this time around to learn about the program in more depth and understand why there were variants in the first place and how that might’ve come about. Here are some highlights, hopefully giving a sense of how the program works. I like to use a software analogy here: the base set of ideas being the fundamental ‘software program’, and the other layers being ‘plug ins’ that can be added or removed based on the individual needs of the trainee. There’s a base program that you then can add things to. A lot of experts know they’re better at programming than someone learning will be so they advise that you don’t tinker with programs. They’re right, because if you stick to a decent program consistently month in month out you’ll get results. On the other hand, if you’re willing to learn on your own, you might also have that urge to tinker with your program. The Greyskull program handles that urge with plug-ins. The framework provides the right amount of constraints. You’re able to make your modifications without deviating entirely from the program. The Frequency Method is a very effective technique for building muscular endurance as well as strength and size. It involves doing multiple sets, never to failure, throughout the day each day of the week (taking one completely off) and accumulating a ton of volume over the course of the week/month. I first heard of this as “greasing the groove”. (No doubt there are tons of other phrases for it as well.) I need to start working this into my life2. There is a lot of money to be made in making things a lot more complicated than need be. This practice of making things “proprietarily complex” as I like to say, is rampant in the strength and conditioning industry. And many other industries. People want to pay for secret ways to do this or that in a way that’s quick, simple, and easy. At the same time, there’s an expectation that there’s some complexity to that secret, otherwise it’d be easier to share and not quite a secret anymore. In a lot of cases, you already know what works, you just have to execute. (Very big “just”.) I used to read intermittent fasting threads and the responses to newbie questions were always pretty straightforward: you’re asking about timing (because it seems like that secret) but you’re really just eating too much. 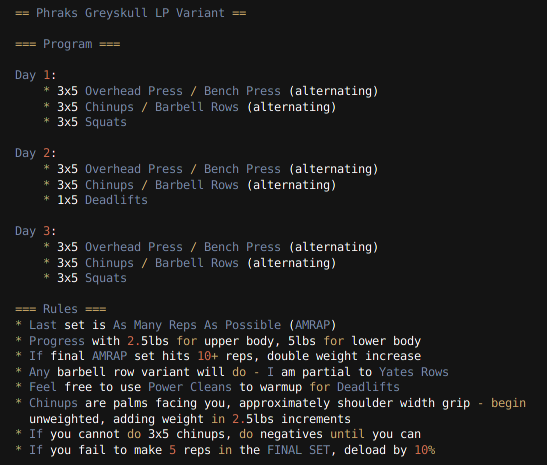 Greyskull LP makes it simple. Simple is different from easy. But the resets and max-rep sets help keep you motivated on the program. I’ll update you in 6 months when I show my sick “after” photo and sell you on very weird tricks like lifting a little bit more every session and maybe not eating that 4th plate at the buffet. ”Good” here is is very very relative. If you’re very strong or a little strong then my results might not be good. But I was happy with them. I wrote something about how this relates to writing. I just remembered I need to dig that up and post it here. When I tried writing consistently I was really able to see how many words you can churn out in a 5-minute break or during a 15-minute bus ride. It adds up and doesn’t drain you at all once you get used to it.